SB 63 will likely be remembered as the first of several steps that ushered in our craft beer golden age. Georgia’s new beer laws (“The Beer Jobs Bill,” SB 63) went into effect at the beginning of the month, bringing us one step closer toward the simple business rights enjoyed by breweries in nearly every other state of the union. We’re not all the way there—not even close—but the bill was the hopeful beginning of an ongoing period of reform that will create a more advantageous (and sensible) business climate for small brewers in Georgia. But ask yourself this: Do you really know how the law is impacting your favorite local brewer? The most obvious and best-publicized result of the new law is that breweries can now sell beer on site to be taken home—or more accurately, they still can’t “sell you beer,” but they can “sell you a brewery tour” that happens to come with some beer to take home with you. That beer can be in an array of new packages: regular old bottles, glass growlers, and even the popular new 32 oz. “Crowler” can. This notion of “selling a tour” is actually different from the previous law, which said that breweries were selling you “a commemorative glass” every time you visited, which just so happened to come with a free tour and free beer samples. That the tour is now technically the product being offered at breweries means you’ll no longer be given glassware to take home every time, which in turn means that many of the breweries will be investing in better, permanent glassware for consumers to use. It also means that the concept and definition of a “tour” has been stretching to the boundaries of logic as a way of streamlining the system. 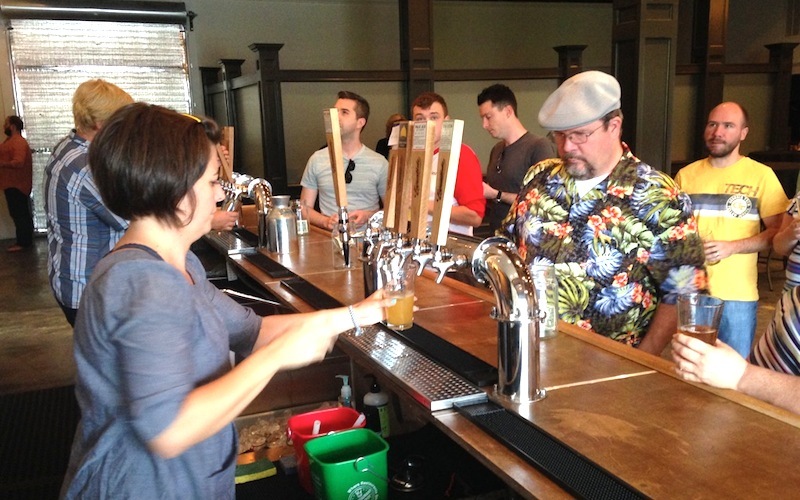 In fact, several breweries such as Wild Heaven Craft Beers and Monday Night Brewing are eliminating the traditional guided tour in favor of simple signs or posters that constitute a “self-guided tour.” In order to buy beer to take home, then, all the consumer technically needs to do is glance at one of those posters to fulfill the requirement that a tour has happened. Does it make any sense? No way. But it serves its purpose in the eyes of brewery owners such as Brian Purcell, CEO and founder of Three Taverns in Decatur, and helps make visits more satisfying, giving many of the breweries an incentive to be open to the public on additional days. Breweries can also use this system to release special, limited, and otherwise non-distributed beer directly to the consumer. If you want to try Wild Heaven’s new sour, Swan Swan Hummingbird, for instance, you’ll have to visit the brewery and fill up a Crowler. In this way, the breweries can send customers home with experimental or limited beers that are never even intended for an official bottling. The provenance of those Crowler cans, by the way, is probably closer than you realize. Just down the interstate in Athens, Dixie Canner has been in business since 1895, and the countertop Crowler seamers available at breweries like Blue Tarp, Jekyll and Wild Heaven are their proprietary design. The cans themselves come from the monolithic Ball Corp., which sells to Dixie in bulk. The Athens company then sells much smaller palettes of cans along with the seamers to individual breweries. Before July 1, Dixie Canner did little business in Georgia, but the passage of the law has finally opened their home state as a ripe new opportunity. Other Atlanta-area breweries will use the conditions of the law to host new types of events in their facilities that were previously impossible. SweetWater in particular sees this as an opportunity to start regularly hosting “bottle release events” in conjunction with new releases, something that makes perfect sense, given that they just launched a new line of 750 ml cork-and-caged bottles. The letter of the new law will allow consumers to visit the brewery, do the obligated special “tour,” and then leave with limited edition bottles, all without having to hunt for them at a liquor store. It’s not just the breweries or brewing industry suppliers who benefit. Atlanta’s food truck community has received a direct boon in the law passage, as they are now allowed to partner with breweries directly, parking their trucks on or near the brewery grounds. It’s an obvious partnership, given that the breweries aren’t allowed to sell food to the public from the same facility where they make beer for distribution. Even the beer retailers see potential benefits to be had as a result of the new law. Despite potentially meaning fewer sales of local beer if it can be sold at the brewery, Ale Yeah! owner Eddie Holley says the rising tide truly does lift all ships.